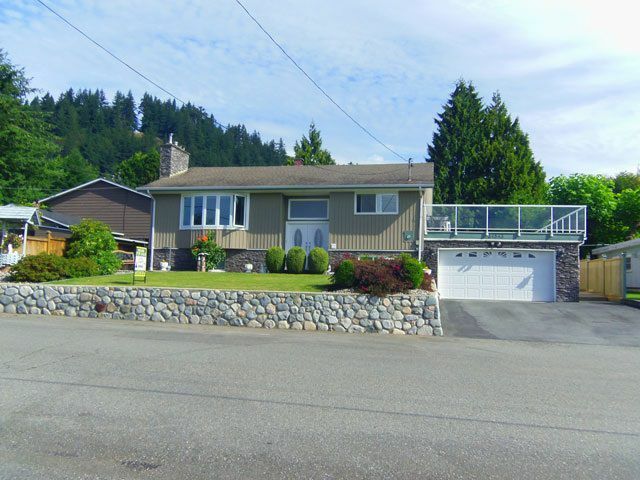 Private & quiet location, home sits on a huge VIEW lot on the desirable Hatzic Bench. 2nd owner of this well constructed home has upgraded & maintained it in a pristine condition. Large, private, beautifully landscaped yard, plus RV parking, a two bedroom suite in the basement with a gorgeous rec room with fireplace & surround sound which can be used by upstairs dwellers or down (or both). 3 bedrooms up and a covered deck off the eating area with built-in natural gas hookup. Large living room with a bay window to the view. Such updates as a new hot water heating system, vinyl windows, total new exterior finish, a 40x20 double garage with 220V wiring is topped with a sundeck to afford fabulous views of the Fraser River & surrounding mountains. Call asap to view - you won't be disappointed!